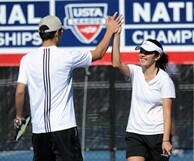 USTA Mobile provides players with tournament as well as league information while on the go. In January of this year, USTA members were treated to an app that made their tennis lives so much easier, as the USTA League iPhone app launched to give players access to everything from their NTRP ratings, match schedules, team statistics, standings and more without having to use a computer. And now, the app has expanded to become USTA Mobile and is better than ever. The revised app now includes tournament information for players, in addition to its previous league offerings. Players can now view their match schedules, scores, tournament draws and find directions to their matches, all in the palms of their hands and while on the go, making getting into the game easier than ever for USTA members. They can also access team standings, search for tournaments and view team rosters and player records. Click here to download the updated USTA Mobile today!